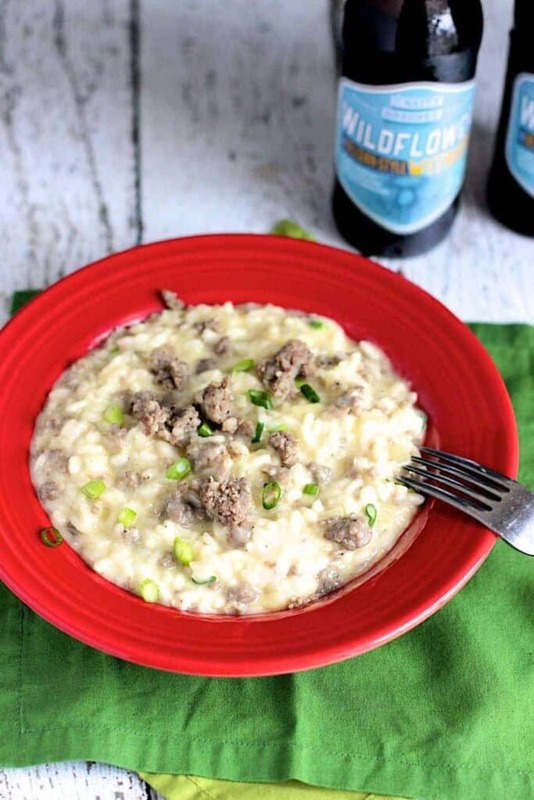 This Beer, Cheddar, and Sausage Risotto combines several of my favorite things: beer, cheese, pork products, and carbs. 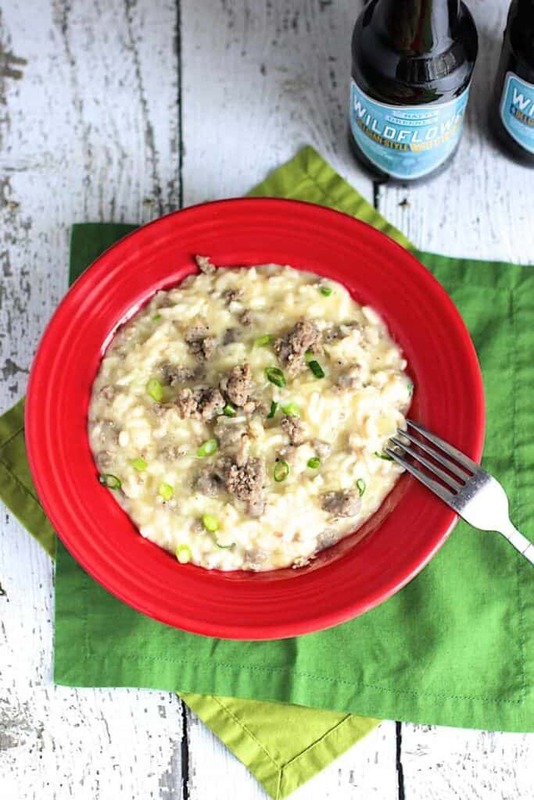 It’ s a fun twist on traditional risotto recipes that call for white wine as a flavor base. 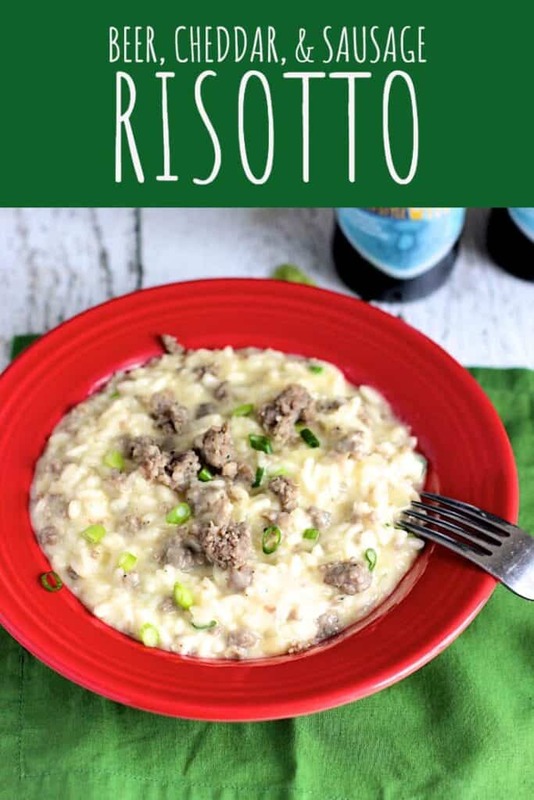 It’s no secret that I love a good risotto. I make it pretty regularly at home (see beet risotto, sweet corn risotto with roasted cherry tomatoes, pumpkin risotto, and avocado and corn risotto). 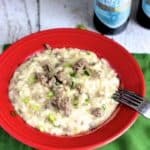 Many risotto recipes start with white wine. But I got to thinking… why not use beer instead? Before ladling in chicken broth, I added a Belgian witbier to the pot. It was definitely a good call. The relatively mild beer doesn’t overpower the dish, but does impart its flavor in the background. In a heavy bottomed pan or Dutch oven, heat 1 tsp of olive oil over medium heat. Add the bulk sausage, crumbling as it cooks. 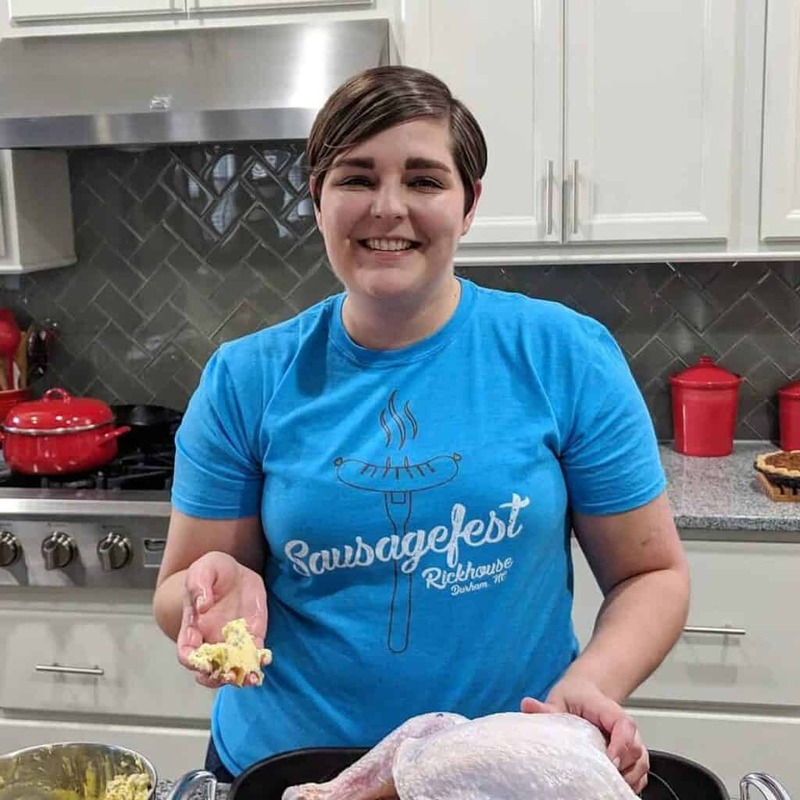 Once the sausage is cooked through, remove it to a plate lined with paper towels. Set aside. Add the chicken broth to a small saucepan and heat over medium heat. Bring it to a simmer, then turn the heat down to low. Wipe the pan that the sausage had cooked in with a paper towel. Add 1 tbs olive oil and 2 tbs butter over medium heat. Once the butter has melted, add the onion and cloves of garlic. Cook until the onion has softened and is translucent. Add the arborio rice and stir so that every grain gets coated in the olive oil and butter. Allow the rice to toast a bit, stirring occasionally. Once it starts to smell nutty, add the beer. Stir occasionally until almost all of the beer has been absorbed by the rice. Turn the heat off under the chicken broth, and add a couple of ladles to the rice. Stir occasionally until, again, almost all of the liquid is absorbed. 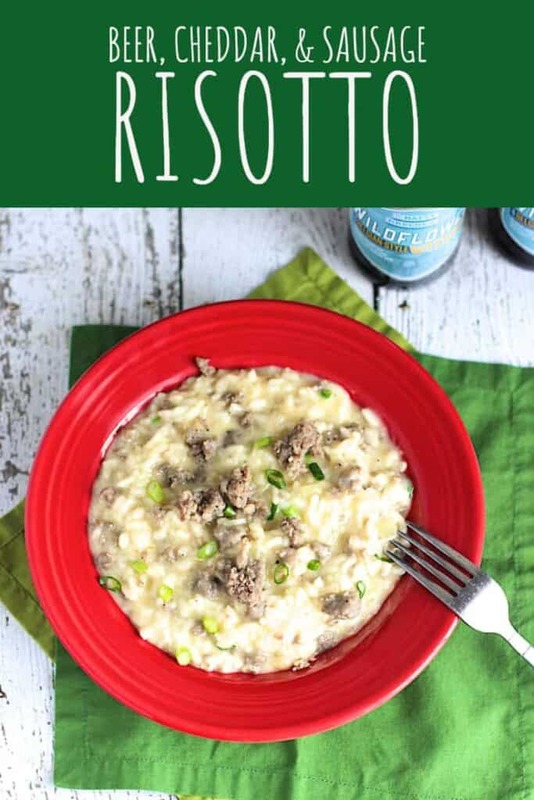 Repeat this process until the risotto is creamy and the rice is no longer al dente. You may or may not use all of the chicken broth. Add the cooked sausage, shredded cheeses, and sliced green onions. Stir to combine. Taste and add salt and pepper if desired.